Since the Revolution Greens Crew is getting more and more pumped about doing triathlons and maintaining great health, we couldnt help but post this story! Most triathletes find it hard to bike while traveling, but here's a hotel that will reward you for your training and being green! The Crowne Plaza hotel in Denmark will pay guest with a $36 meal voucher for every 10 watt-hours of electricity they generate. If you are wondering that's about 15 minutes of spinning on the stationary bike. "Many of our visitors are business people who enjoy going to the gym. 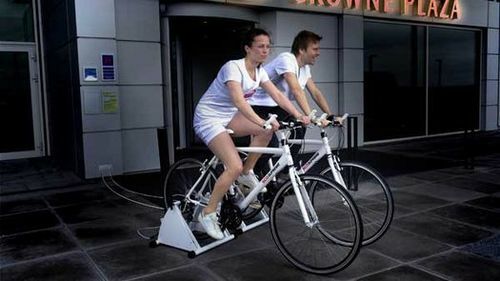 There might be the odd person who will cycle just to get a free meal, but I don't think people will exploit the initiative overall," hotel spokeswoman Frederikke Toemmergaard told the BBC News. The BBC goes on to report that, "The bicycles will have iPhones attached to the handlebars measuring how much power is being generated for the hotel. The plan, a world-first, will be launched on 19 April and run for a year, the hotel says. Only guests staying at the hotel will be able to take part"
"Because Copenhagen is strongly associated with cycling, we felt the bicycle would work well as a symbol of the hotel's green profile," Ms Toemmergaard added. If and when the first guest training for an Ironman check into the hotel we suggest that the Danish Crowne Plaza better have plenty of meal vouchers ready and waiting because they'll burn through dozens in just one long training session on the bike.